From a frighteningly low 17 recorded nesting pairs in 1931, to over 8,000 individuals today, the Sandhill Crane has made an incredible comeback in Michigan. The Dance of the Sandhill Crane documents the extraordinary life of this truly ancient species, largely unchanged since the Miocene Epoch. 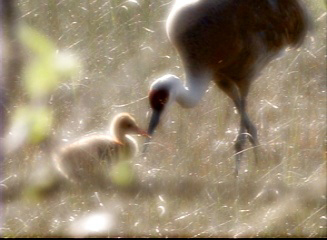 Experience courtship dancing, chick hatching, life around the marsh and beyond, and intense sibling rivalry, a significant cause of chick mortality. Filmed around Petoskey, Michigan. Mon-Sat, or if you’re in the Petoskey area, stop by the address given at the bottom of the page. Cost is $20. If The Uncommon Loon and Dance of the Sandhill Crane are purchased as a set, cost is $30, plus $5 shipping. For more information contact planetmich@gmail.com. To watch a preview, click the button below.